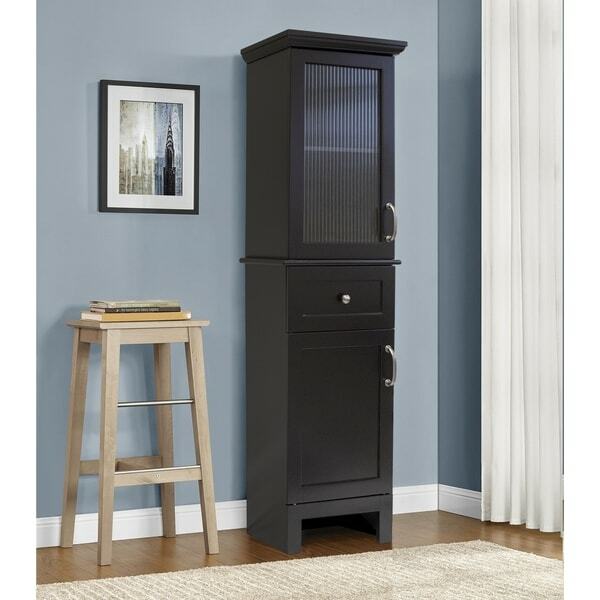 Love love love this cabinet it’s sleek, compact and very sturdy. Perfect for my bathroom, love the color as well. The frosted glass add a lot of glam to whole look. Omg just love it. Create valuable storage while giving up very little space with this attractive bathroom storage cabinet. Framed glass door with fluted, tempered glass. Handy drawer with metal drawer guides. Attractive pewter pulls and knobs. Raised panel swing out door hides large storage area. Adjustable, removable shelf in upper compartment. Dark Brown painted espresso finish. Likes: was easy to put together, and looks really nice. All the pieces were marked well, all the hardware holes lined up perfectly. No damage or flaws at all. It is small, tho, check the dimensions. I have a very small bathroom, so it works well for the space I needed it for. It's only real flaw for me, is it doesn't have a shelf in the bottom door area. My son is going to help me put one in and that will take care of that issue! It feels just a little unsteady, but does come with anchors for the wall, which I am choosing not to use...really, an excellent purchase for the money! This fit perfectly where I needed it (between the wall and my washing machine/dryer combo). I was nervous that it wouldn't fit in the 15.5" space wide, but this storage tower is exactly 15" wide and fits like a glove! Very nice piece that fit perfectly into a small space in my bathroom. It was an easy assembly and the cabinet is very well made. You'd think it was purchased assembled and at a much higher price than I paid. I like it so much that I may buy another for the second bathroom. Holds lots of storage. Absolutely perfect! Matched my bathroom sink perfectly and was relatively easy to install. In the instructions, it recommends to use two people and I too, recommend two people. I put it together myself but when it came to installing the doors, I had a bit of trouble. Outside of that, the assembly process was easy, the tower fits PERFECTLY in my bathroom, and I am happy I made the purchase. I’m using the storage cabinets as salon booths. They are nice, strong cabinets. I changed the hardware because it’s alittle old fashion other than that I’m very pleased with the purchase. Like the storage tower ,I thought it was taller but it works. Real nice easy to put together. Really nice looking. Worth the price. Great storage tower my laundry room. Fits perfect in a corner. Perfect for a smaller room. Holds quite a bit. Easy to assemble and move. Very nice design. Well worth the money. The piece looks very nice. Worth the amount t I paid. It is not going to fit the purpose I intended it to be used for since it is smaller than I thought it would be. It is true to size specified, but would mostly work for a bathroom or child's room. Size is perfect for small bathroom, BUT if your not going to paint it a different color just know that it’s black & kinda purple. You get what u pay for, it doesn’t even have screws that hold it together, it has wood dowls. "What type of wood is this made with? Are the doors reversible so they can open left to right or right to left??" Medium Density Fiberboard. The doors are not reversible. Why You Need a Corner Cabinet from Overstock.com. Our guides provide customers with information about buying a corner cabinet. How to Install a Bathroom Cabinet from Overstock.com. Our guides provide customers with information about how to install bathroom cabinets.